In the second part of this series, I noted that “both of India’s main parties actually combine both the statist and non-statist approaches in different permutations, and neither is ideologically consistent.” As a result, there has been a convergence, rather than a divergence, of the Bharatiya Janata Party (BJP) and Congress, because the BJP and Congress, for all their differences, in terms of ideology and their political bases, must win over many of the same people beyond their respective bases to have enough votes to come to power. Many of the people who tend to vote for both parties have similar demographic profiles, though both parties also have relatively unflippable bases: Hindu nationalists, or followers of Hindutva (Hinduness), rooted in the values of Indian conservatism on one hand, and secular, cosmopolitan liberals, and most of the Muslim community on the other hand. Thus, the fortunes of both parties are in fact closely tied, and ideologically they are converging, rather than diverging, with the BJP adopting more statist views, and Congress becoming more Hindu. Sometimes, both parties seem to be in a race to the bottom, in order to enact the most populist, vote-getting policies possible. Right now, with an eye to India’s upcoming national elections, both the BJP and Congress are handing out loan waivers for farmers and reducing taxes. These policies are aimed at getting farmer and middle-class votes. Conversely, both parties have at times promised and implemented market-based reforms, but never too many. India continues to be hamstrung with bloated bureausocialistic policies. In terms of the attitudes of the middle class, the main difference is that the BJP has replaced the secular nationalism of the Congress, which grew up around the legends of India’s independence heroes, with a Hindu nationalism that draws more from India’s ancient past. With the national decline of the Congress Party, most people who did not want to vote for other parties simply voted for the BJP, which they saw as a replacement. In many states, the share of voters who voted for various caste-based and regional parties remained steady, but the share of Congress to BJP voters shifted in inverse proportion to each other, for example in Tripura’s February 2018 elections. In Rajasthan, the BJP and Congress keep on exchanging power every five years, showing that certain groups of voters are interchangeable between the two parties, such as the upper-caste Rajputs, former aristocrats who have benefited both from elite-recruitment into the Congress by Indira Gandhi in the 1970s and who also seem themselves as bastions of Hindu chivalry. After all, both parties are national parties that seek to overcome India’s regional, linguistic, and caste-based divisions in the name of a greater, more united India. To those who are beyond regionalism or casteism, only the BJP and Congress exist as viable options, with other attempts at building national parties such as the Swarajya Party and Aam Aadmi Party (AAP) having failed. As the Indian political commentator Barkha Dutt points out in The Washington Post, “the center-right has displaced the center-left as India’s dominant political narrative.” But this is a space that both parties can occupy. Most Indians are neither Hindu nationalists nor secular liberals, but somewhere in between, as evidenced by the fact that the Congress Party’s president, Rahul Gandhi, seems to have picked up with his newfound interest in Hinduism, derided by some on the right as “Hindu-lite,” or “Hindutva-lite.” But Hindu-lite is actually a good term to describe the beliefs of the middle class, the urban youth, and the emerging upwardly mobile lower-middle class. These groups are at once proud of and interested in India’s past and culture, but also willing to apply these customs selectively at a personal and familial level, while being open to new ideas and cultural influences from around the world. Moreover, these groups remain skeptical of Hinduism as a political movement, and aren’t interested in anti-Muslim rhetoric, instead seeing Hinduism more as a mascot for their identity. It should not be forgotten that the Congress Party, which largely shaped post-independence India, has an identity and symbolism based on its Hindu-Buddhist past. The national symbols of India, imparted by Congress to India, are from the pre-Islamic past: the chakra (wheel) of the Mauryan Emperor Ashoka, which represents dharma (righteousness), the choice to also call India Bharat in the constitution, and the national motto Satyameva Jayate सत्यमेव जयते (truth alone triumphs) from the mantra found at 3.1.6 of the Mundaka Upanishad. 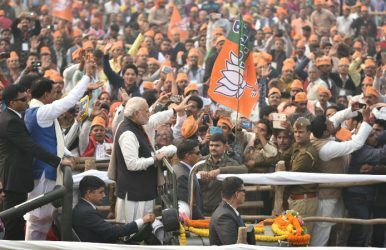 The BJP, for all its successes, is still largely operating in the operational framework set by the Congress Party, in an India set up on a Western-style constitution and an Indian nationalism constructed from various episodes of Hindu, Buddhist, and even Muslim history and empires, rather than just a select set of Hindu eras. The Red Fort where Prime Minister Narendra Modi, as well as previous prime ministers, have addressed India from several times was built by the Mughal Emperor Shah Jahan (reigned 1628-1658), and has been a symbol of Indian unity and governance since 1947. It is telling that the BJP has continued the customs of previous leaders, despite differences in ideology. It has also have had to transcend its Hindu nationalist roots to do well throughout the Christian northeast. Despite its conservative base, the BJP has often shown itself able to be flexible and broader in its appeal. Indeed, both parties must, if they wish to obtain power. India’s way forward will be a symbiotic endeavor between its two main parties, often antagonistic toward each other, but offering similar doses of reform and mismanagement. This explains why India’s central government and states will continue to seesaw mostly between the BJP and Congress, and the occasion local party, depending on the state, because every party will offer solutions, and no party will fully deliver. But all is not lost. Despite mismanagement, India is home to a dynamic economy, and a vibrant culture. India is set to become the world’s 5th largest economy by gross domestic product in 2019, overtaking its former colonial master, Great Britain. It possesses a middle class that is both Indian and Western, with one foot in the door of tradition, family rituals, and religious customs, and another foot in the door of modernity, individualism, and consumerism, the glitz of the IT industry and Bollywood. A middle class that is torn between the ideals of merit and market economics on the one hand, and the state’s power to eradicate embarrassments such as poverty and untouchability. This is a middle class that can swing between the BJP and Congress, and force marginal improvements, just enough to keep the country on an upward trajectory. Farmers, too, the majority of India’s population can also swing between the two parties on the basis of whomever promises the most relief to the issues facing this group: poverty, debt, water, cheap fuel, crop prices, and so on, and as such can prevent the worst, and obtain gradual benefits. Thus, despite the circumstances, India’s people have managed to do pretty well.